A fisherman has become the latest victim of an animal rights group targeting the Dorset lobster industry. 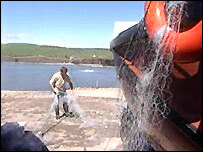 Former soldier Nick Ford, who has worked out of Kimmeridge Bay for 17 years, has had his nets slashed. A group calling itself the Lobster Liberation Front has since claimed it was behind the Easter Sunday attack. The group declared "war" on the industry last summer. A police spokesman said the attacks threatened "little fishermen's" livelihoods. Mr Ford said: "I just honestly don't know what possesses them to interfere with other people's livings. "I expect that if I interfered with their living they wouldn't be very happy." The front claimed responsibility for the attack on the website of the Southern Animal Rights Coalition. Coalition spokesman Keith Mann said: "I certainly couldn't condemn anybody for doing such a thing. "Lobsters are being boiled alive for people to eat unnecessarily. "This is causing unnecessary suffering. So for us, anything people do to raise awareness of those issues has got to be a positive thing." Ch Insp Nicholas Maton, of Dorset Police, said: "It's a particularly nasty criminal damage in that it is criminal damage against people's livelihoods. "These are not big corporations. These are little fishermen whose nets have been passed down from generation to generation who are only trying to earn a living."